This is what happens if you put down a basket full of laundry in our house. You will have a cat sitting in it in a matter of a few minutes. 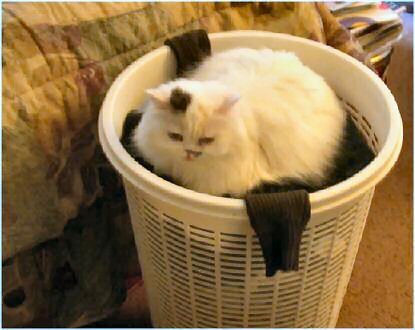 I swear I only walked out of the room for a minute or so and when I got back Dinah was sitting in the basket - all happy and purring. After I am done with this post I will probably move on to cleaning the bathroom sink and then the kitchen counters. They are both in desperate need of some cleaning. And tomorrow it's back to work and more training. So far we are making good progress so I am hoping everything is going to work out ok.